Lee Allison at Arizona Geology recently sent me a link to a nifty article about a sandstone quarry in Flagstaff. The article details the history of the use of the Moenkopi Formation sandstone, which sold under the name Arizona Red. Construction of a new fire station prompted the story as it will be built on the site of the old quarry. The quarry opened in 1888 providing massive blocks of stone for the growing town and quickly attracted the attention of builders around the west. Many buildings with Arizona Red still stand in Flagstaff, including the Coconino County Courthouse, the Babbitt Brothers building (which also contains brick made from Moenkopi derived soils), and a host of structures on the Northern Arizona University campus. By 1910, however, Arizona Red was no longer popular. Residents of Flagstaff were not the first to use the Moenkopi for building. Beautiful structures with it can be found just north of Flagstaff in Wupatki National Monument. The Sinagua people first started to build here around 675 CE. They moved out of the area just prior to the 1064 eruption of nearby Sunset Crater. 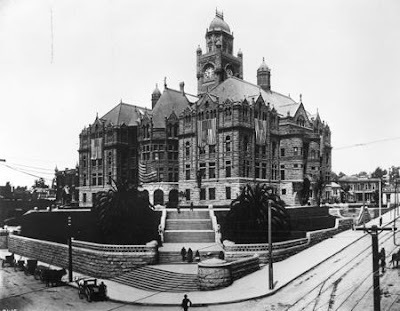 As Marie Jackson noted in her wonderful book Stone Landmarks: Flagstaff’s Geology and Historic Building Stones, more than 500 boxcars of Arizona Red were sent to Los Angeles for its county courthouse in 1889. 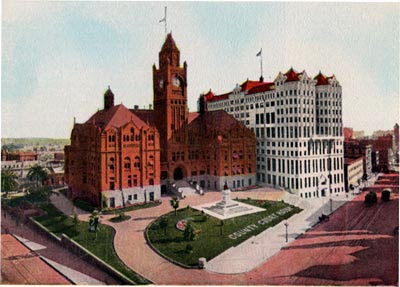 Unfortunately, damage from a 1933 earthquake led to demolition in 1936. 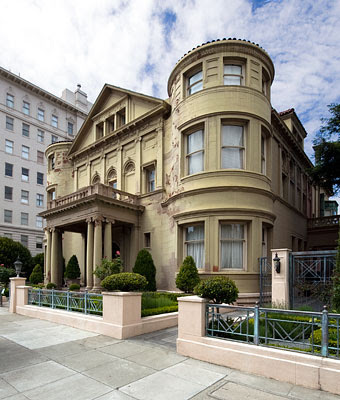 Another well-known California edifice made of Arizona Red is the Whittier Mansion in San Francisco. 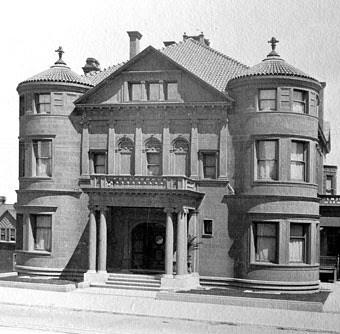 Built between 1894 and 1896, the mansion has had a colorful history of ownership, including shipping and mercantile magnate William Franklin Whittier; the German Reich, for use as a consulate; the United States Government, which seized the building during World War II; and the California Historical Society. It is now a private residence, curiously painted an odd tan/yellow. Perhaps that is why either the ghosts of Whittier or his son have been reported to haunt the house. Jackson describes the stone as “rather soft…in which the sand grains are not especially well cemented.” This weakness contributed to the stone’s downfall in areas wetter than Flagstaff. In particular, she noted that Arizona Red did poorly on the Whittier. That weakness, however, also made it easy for masons to carve elaborate detailing, which can still be seen in buildings in more arid regions. The Moenkopi Formation extends across the Colorado Plateau and formed between 242 and 237 million years ago. Deposition occurred on a wide coastal plain in a semi-arid environment. Around Flagstaff the sands came from the overflow of streams onto the sand and mudflats. In other areas, the mudflats preserve excellent trace fossils, such as raindrops and reptile tracks. Fine layers of Moenkopi make up the base of many slopes in the canyonlands region of southern Utah. One final note that ties back to my title for this posting. When I first moved to Boston in 1996 away from Moab, Utah, I sorely missed the red rock canyons of the desert, but as I noted in my book Stories in Stone, I happened upon the brownstone base of Harvard Hall on Harvard’s campus. After doing my part as an agent of erosion, I made the simple observation that brownstone and red rock are basically the same thing–a sandstone colored by iron. It was a wonderful day for me as I realized that I could make a deeper connection to geology through building stone.